Alicia Quatermain & The Stone of Fate Collector's Edition is rated 4.2 out of 5 by 13. Rated 5 out of 5 by andibeard from Fast-paced and challenging! I don't play a lot of TM games, but this is exactly the kind I like. It has a fun theme, plenty of levels, and with some sweat, it's possible to achieve three trophies on each level (I can't imagine playing on the "hard" level, though--yikes). Playing the bonus levels and getting the puzzle pieces was fun, but not necessary if you want to skip the CE and go for the SE version. I like that you can queue up the next task while the workers are busy, but it was annoying to me that Alicia doesn't do anything except the "Alicia must do this" tasks. It slowed down game play on the hardest levels--but I guess that's the point! 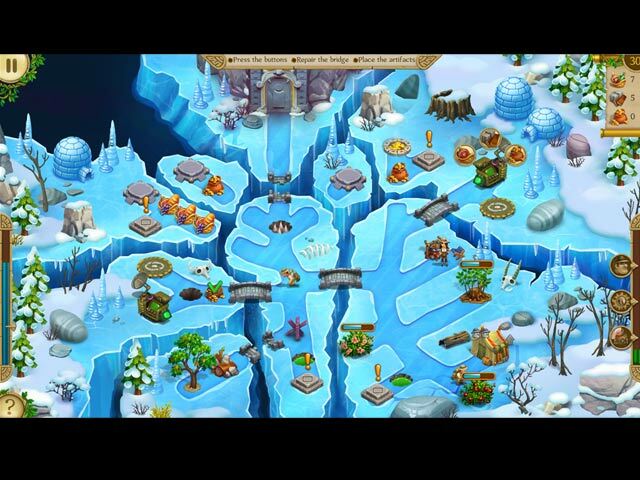 The different environments were nice, too--even snow and ice show up in some levels of play. It's hard to create much variety of tasks in a typical TM game, but they work hard to make it interesting from one level to the next, and the dialog was helpful rather than just fluff. I have some quibbles with the storyline--who was the bad guy who just vanished partway through the game? Why were there dragon eggs without any dragons?? I feel like the story was cobbled together rather than well-planned before or during development, but this is a minor issue. I had a lot of fun with this one. Like many TM games, it got a bit addictive! Recommended if you like a challenge but not an impossible one! Rated 5 out of 5 by liselore from Like to play it Just ours flying by playing it. Rated 5 out of 5 by Karavan from Great fun and worth the collectors edition It took me awhile to buy this per reviews that the collectors edition might not be worth it. I am glad I finally bought this game and did not wait any longer for a possible regular edition. 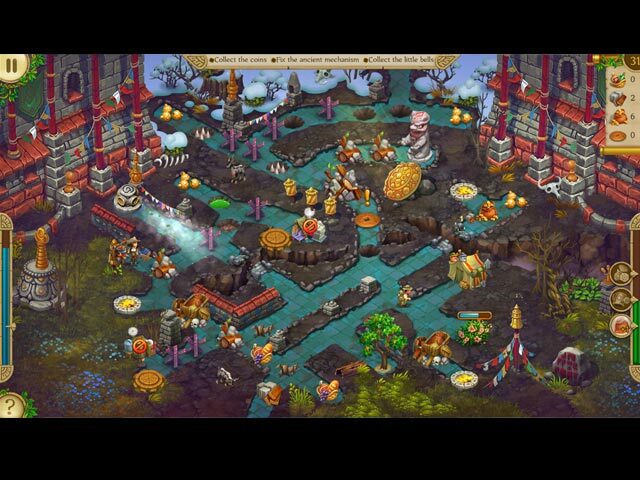 This is a truly delightful game with wonderful animation, bright and cheerful graphics, and good game play pace. I am very happy with the collectors edition features of a bonus level after finding puzzle pieces and completing a puzzle to the built in walk through. I like to get three stars and get tired of searching for clues in off sight places so this was helpful on some levels. I also applaud the developers for listening to previous Alicia game requests to make it easier to get three stars by providing three levels of play. I play for fun and this is a very fun game. Rated 5 out of 5 by Bonz54 from Get It !!! If you enjoy this type of TM game this is one of my favorites. The graphics are fantastic and the game is challenging. To gain the 3 stars on each level, you need to use some strategy, so it keeps it interesting but not frustrating. I rated the storyline slightly lower, but overall this is a lot of fun to play and replay. If you liked the first Alice, you'll really enjoy this one. Not sure it warrants CE status, since all you get are screensavers. I would still purchase this one, you won't regret. Rated 5 out of 5 by LanaPook from Another great Alicia Quatermain game! My favorite games are time management and this one is a doozie. The graphics are excellent. It is very easy to que actions and cancel them which is not the case with many games. There are 3 levels of difficulty, relaxed, easy and hard. Both easy and hard setting are challenging. A game that is too easy just isn't fun so you do have to think a little with this one. You get hours of game play. It's all good! Rated 5 out of 5 by BobbyM1 from AWESOME New adventures of Alicia Quatermain. Made with love: excellent drawing, sound, music, story. Clear and interesting tasks. Who else has not played - rather try it. Love this game. Rated 5 out of 5 by pennmom36 from LOVE THE GAME BUT WHY ON EARTH IS THIS A COLLECTOR'S EDITION????? Alicia Quatermain has a whole new adventure to take us on, searching for the Stone of Fate! The Stone of Fate is believed to grant great power to whomever possesses the ancient relic, but finding the Stone is half the adventure. Alicia and her team have traveled the globe to the jungles of India, but Alicia isn't the only adventurer with an eye on the prize. A secret organization seems to be one step ahead of Alicia, sabotaging her every move, and endangering the lives of innocent people. Who will get to the treasure first? The graphics are some of the best I've seen in a TM game. The critters are realistic, the trees actually look like trees, there are beautiful flowers and shrubs, even beautiful water lillies. I love the different quests available, such as charming snales to make them leave. Each level has Treasure Chests to open, some of which have absolutely nothing inside, but that's pretty realistic once you think about it. Each level also has a Hidden Puzzle piece to find, and I'm assuming it's part of the CE bling, but I could be wrong. You can play in an Easy untimed mode, Normal or Expert mode, and if you earn expert status of 3 stars, it will help Alicia clean and decorate her grandfather's Museum. Again I'm presuming this is a Collector's Edition bling feature. Any level can be re-played, and if you click on the Question Mark Icon, located on the bottom left of the screen, it will access the Strategy Guide, step by step walkthrough for that level, and also shows the Puzzle Piece location. The level goals are shown at the top of the screen, a meter on the left of the screen shows your level status and how much time you have left before losing a star rating. A Bonus Meter is shown on the right side of the screen that give you various bonuses such as an extra worker, speeding up the existing workers, an automatic refil of resources, or a larger sack to allow the workers to carry more resources. There are a ton of Achievements to earn, and each chapter has specific achievements available. I really enjoyed playing this sequel Time Management game, however, I really don't see a need for a Collector's Edition version. I personally don't care about 6 wallpapers, a boring puzzle piece, decorating a virtual museum, or earning an Achievement Trophy. I will admit that the built in Strategy Guide for each individual level, is a cool idea, but it's not worth 7 more bucks! 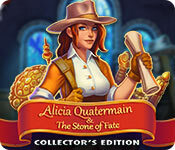 ALICIA QUATERMAIN GAMES AVAILABLE Title***Collector's Edition Release Date***Average Rating 1-Secrets of the Lost Treasures (May 16-2017) 3.8 2-The Stone of Fate (November 28-2017) n/a This Collector's Edition version has 6 Wallpapers, a Hidden Jigsaw Rune in each scene, items to clean and decorate Alicia's grandfather's Museum and a built in Strategy Guide, enjoy! Rated 4 out of 5 by Royental from Good for me! 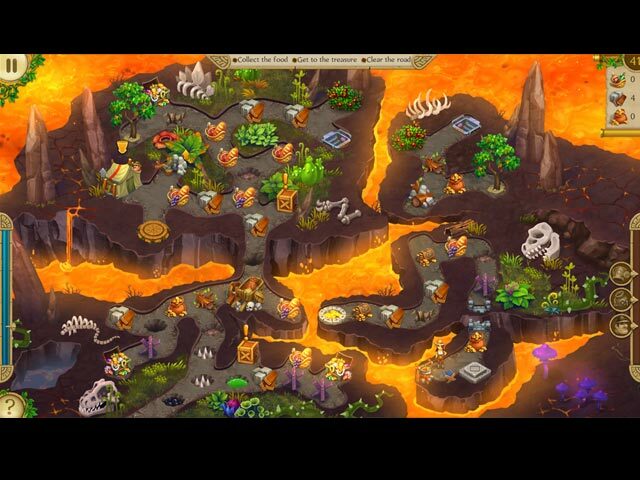 The main advantages of this game are graphics and visual elements. Especially I like elephants. They are real adorable! I think I could buy it. Rated 4 out of 5 by Totty_Tara from Well well well! What a pleasant surprise! I did not much care for the previous efforts in this series which I thought were overcomplicated and hence difficult to follow but this game reminded me of some of the great TM games of the past like Roads of Rome (which has also seen a recent return to glory)! Clear instructions, obvious goals, good graphics, so I ended the demo with a smile on my face! It did not seem to be anywhere near the demo time but that was because I enjoyed myself so much! The only thing that I didn't greatly love was the storyline but I'm quite sure many of you will like it and it's always such a personal opinion so don't let me put you off because of that. At the very least I urge you to give it a try? Enjoy! Rated 3 out of 5 by CherryPearl23 from Ok game but not worth purchasing My major dislike of this game is the fact that your workers ALWAYS return to the tent after they complete a task. Even though you click on other tasks for them to do while they are working to complete the first task, they ALWAYS return to that darn tent instead of going to the next task. This, in my opinion. makes it harder to earn the 3 stars under the "Normal and Hard" play. I play on the "Easy" selection and you DON'T earn 3 stars with this selection and because of these issues, I don't play this game all that often. I regret purchasing this game. Out of the many games I have purchased from Big Fish, this is the 2nd game that I regret purchasing.